Check out this fun Bunny Bait recipe for Easter & Spring time! We’ve been thinking of fun things to do & Spring Break activities for kids. Who doesn’t love cooking…and eating? This “Bunny Bait” recipe is perfect for Easter & Spring! You can make minor adjustments to the recipe, but however you choose to make it…it’ll be gone in minutes! …I ended up making 4 batches and was eating my weight in this stuff I had to take some to work to share with my coworkers before I ate the whole thing! What Do You Need for Bunny Bait? **add extra of whichever Bunny Bait ingredients are your children’s favorites! How to Make Easter Bunny Bait? 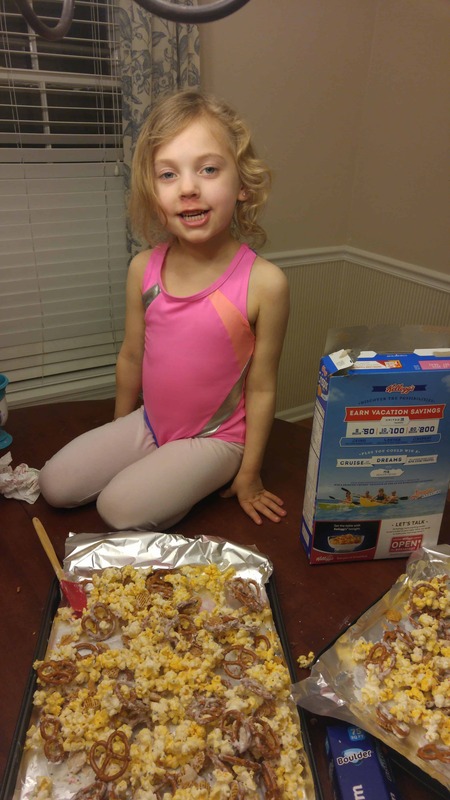 Then, spread the cereal, pretzels, and popcorn evenly on the sheet. Using a spatula or rubber scraper to toss the mixture around – evenly coat your cereal/pretzel/popcorn mixture. Let the chocolate cool a bit before tossing the chocolate covered candies and sprinkles into the mixture. Finally…try not to eat the whole batch in one sitting!!! I hope you enjoy this “Bunny Bait” as much as our family did! This will definitely be one of our go-to Easter recipes for the family get-together. Mix up the colored candies for each holiday! …4th of July snacks using only red, white, and blue candies OR Halloween munchies with orange, green and black candies. You could even do this for St. Patrick’s Day, Christmas, & Valentine’s Day. Have a great week, Spring Break, & Easter! Be sure to get The Scoop, so you never miss out on Weekend Planners, Kids Club Events, & giveaways for movie tickets, previews, & other tickets.